What began originally as an idea brought up in conversation about contrasting experiences during simultaneous pro-immigration reform marches in Spring of 2006, untitled (Lamont), has existed in several ways and in a variety of contexts. The idea was first turned into an experience out of which a small series of photographs were produced. The photographs were then turned into three-dimensional props for a public performance, then into an installation, and then recreated as stand-alone sculptures. 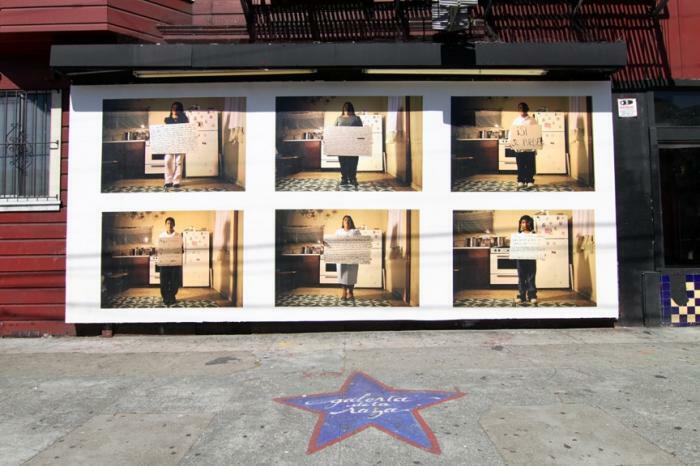 Now it’s been transformed into an active billboard within this exhibit, where it continues to engage in dialogue, focusing on the messages that the protagonists in the images are wishing to communicate. The project’s primary function is to serve as a vehicle for testimony and reflection.